If you’re coming to Oahu during your Hawaii vacation, you now have the opportunity to visit the largest open-air mall in the the world, Ala Moana Center! The distinction comes after Thursday’s grand opening of the Ewa Wing Expansion, which added 650,000 square feet to the already sprawling center. To celebrate, mall executives invited selected media, including Hawaii Aloha Travel, to take part in the grand-opening festivities. 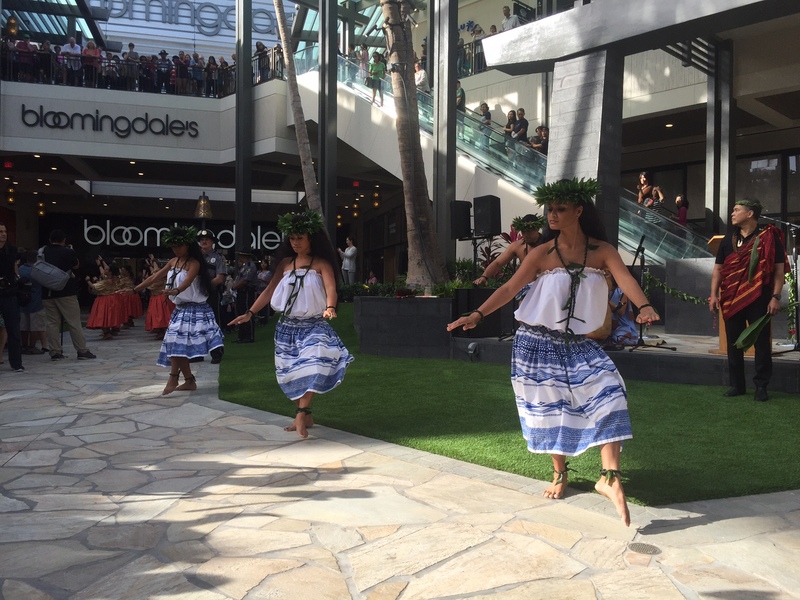 During the half-hour event (which attracted hundreds of excited shoppers, too), featured speakers gushed about the completed project, hula dancers performed for the crowd, and even the Royal Hawaiian Band played after a traditional Hawaiian blessing. In all, the event was every bit as fun and enjoyable as the new Ewa Wing itself. Hula dancers and a Hawaiian blessing were part of the celebration, which marked the end of the two-year project. The Ewa Wing Expansion features three levels of new retail space and five new levels of parking, resulting in a total of 4,500 stalls. In all, Ala Moana Center now has 11,000 free parking stalls. Of course, Ala Moana Center’s big addition is the state’s first Bloomingdale’s store, which will serve as the Ewa Wing’s flagship department store. 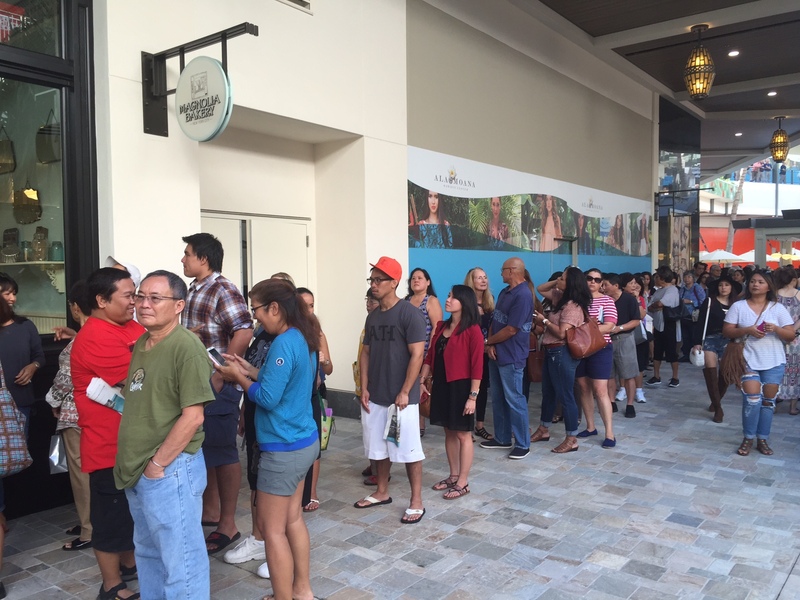 Customers waited in line at the new Magnolia Bakery, just one of the many retail stores that opened today at Ala Moana Center. In this Bloomingdale’s, shoppers can visit the “beauty at your service” area for a complimentary facial and take advantage of the store’s concierge service. The Ala Moana location also features fitting rooms with tablets that connect shoppers to their sales associates and mirrors that allow shoppers to change the lighting. One of the most convenient ways to check-out the new Ewa Wing Expansion is to book an Oahu activity package through Hawaii Aloha Travel. When you speak with your travel professional, let them know you’d like to reserve some time to shop at Ala Moana Center, and he/she can help create an itinerary that includes some much-needed shopping time! With more than 42 million visitations per year, Ala Moana Center is more than just a shopping center—it’s a visitor destination in itself. So, carve-out some time to pay the center a visit during your next Hawaii vacation. And, bring your credit card!